author: Graham Atherton-Ryan is one of our members in the UK. Greg Hunt has recently shown he is in full defence of a sick barbaric kangaroo killing industry that exists in Australia. Other members of parliament see them as an artificial plague on the landscape !! 2010 population estimates put the numbers of kangaroos in Australia at just over 25 million; down by over 32 million on the 2001 figure of 57.4 million. What is the benchmark for “plague” and normal kangaroo populations? Historic records report numerous macropods across Australia, as native animals. Six species of macropod are already EXTINCT and a number of species listed as ENDANGERED OR THREATENED They are not immune from droughts, disasters, loss of habitats, and human hunting! 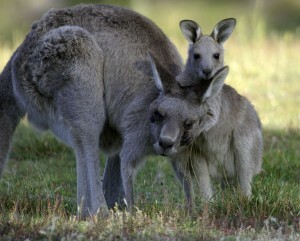 In Queensland alone kangaroo populations have crashed by 50% in the last year alone. Kangaroos are wildlife, and they can’t be farmed or handled like livestock! It means the horrendous disposal of in-pouch and at-foot joeys. Official numbers for the kill do not include the baby kangaroos that also die as a result, the worthless ‘waste’ of the industry. Unlike livestock, kangaroos grow and mature slowly, produce only a few kilograms of human edible meat, and take up to 12 years to grow to maximum size. The Australian Government have high hopes the free trade agreement with China could open up a lucrative market for “roo and kanga bangers”. They obviously think that there is an unlimited and inexhaustible supply of kangaroo meat, and that these animals can breed endlessly to meet the demands of the world, once they acquire a taste for their meat!